When small strains and sprains happen at gymnastics practice, there is a simple formula every gymnastics parent and coach should memorize and use: RICE. A twisted ankle or jammed up wrist will heal much more quickly when you follow these simple steps. REST – If a joint is swollen, take it easy on activities until the swelling goes away. The big problem with using a sore joint isn’t slowed healing (although that IS an issue), but instead that in trying to protect the joint, your gymnast will injure herself somewhere else, usually worse. Example: A twisted ankle is painful, and an athlete will unconsciously try to keep weight off of it. When sticking a landing she might throw all of her mass onto the opposite leg and tear up her knee. A sprained ankle heals much faster than a torn knee. 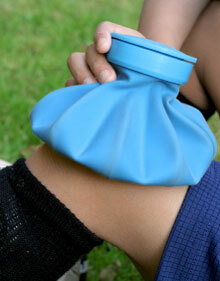 ICE – A bag of ice held to the injury, ice massage, or an ice bucket are all icing options for an injury. You can use a big of ice for everything, use ice massage on sore muscles (it gets in deep), and an ice bucket is best for ankles and feet. When you’re icing, use 20 minutes of ice every two hours. And keep icing for a day after the pain is gone. Note: If you’re confused about using ice or heat, always go with ice. Heat may make an injury worse. 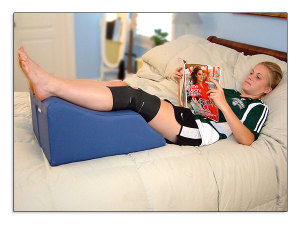 COMPRESS – Pressure will help reduce swelling an increase healing speed. 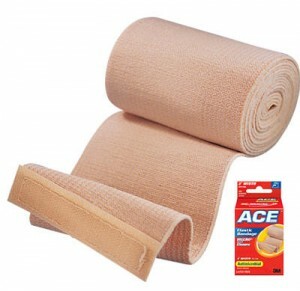 Every Carson City Gymnastics parent should have an ACE bandage handy. When compressing an injury, start wrapping from the far end of the injury and wrap in towards the body. Example: For a twisted ankle, start wrapping in the middle of the foot and wrap in towards and over the ankle. Compressing this way helps get the swelling out of the joint. ELEVATE – This means to keep the injury above heart level to speed healing by “draining” the swelling into the body. Example: For a sprained ankle, raise the foot up on a few pillows to keep the lower leg above torso level while lying down. So the next time one of your young gymnasts gets a little twisted up, remember the RICE formula and they will be back on the mats in no time flat!